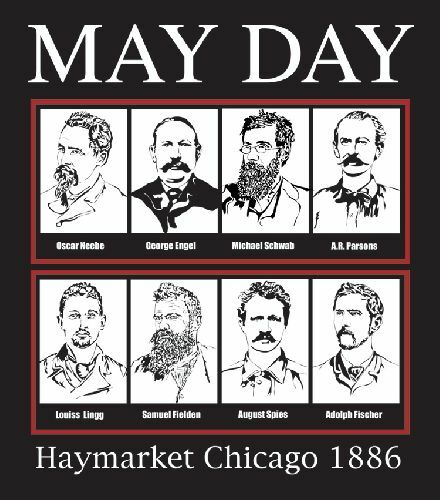 The Industrial Workers of the World have an excellent pamphlet-length article on the radical history of May Day; you might also want to read the Rouge Forum May Day flyer. 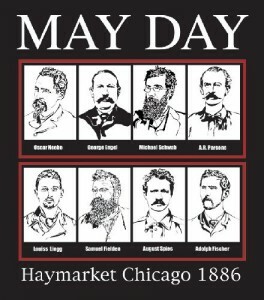 Check out AK Press’s collection of books on May Day/Haymarket/anarchism. MP3s of “The Internationale” in over 40 languages. Unites the human race. (repeat). Drive the indolent from the soil. We’ve too long been the vultures prey. The dawn brings in a brighter day. It is nearly Mayday, the international workers holiday. Since the massive 2006 immigrant rights marches, what amounted to the biggest general strike in the last seventy years, Mayday is finally restored to the US, where it began. For far too many years, it was replaced by Law Day (imposed in the fifties), a day when people were supposed to celebrate the tyranny of property laws. Now around the US students, kids, workers, educators, community people, and organizers will hit the streets and rally again. School workers can support the kids who are likely to take the lead in walking out of school, joining the many scheduled marches in the struggle for equality and social justice. And we can join them. The Rouge Forum has celebrated Mayday for the last eleven years. Here is our traditional flyer. And an update for our current context. And a link to the music and lyrics of The Internationale. Hope to see you at the Rouge Forum Conference in Ypsilanti, May 15 to 17. Life travels upward in spirals. curves of the future above them.